The position was created by an independent revolutionary state, the "Malolos Republic", but was not recognized internationally. The Philippine government now recognizes the Malolos Republic as its predecessor state, which it also calls the First Philippine Republic. From an international standpoint at that time, the First Philippine Republic never existed but rather, Spain ceded its Spanish East Indies to the United States of America by the Treaty of Paris following the Spanish–American War. Therefore, the international community only recognizes the first Philippine presidency under the US-associated Commonwealth of the Philippines. Filipinos refer to their President as Pangulo or Presidente. The President serves a single, fixed, six year term without possibility of re-election. On June 30, 2016, Rodrigo Duterte was sworn in as the 16th and current president. In Filipino, one of the two official languages of the Philippines, the President is referred to as Pangulo. In the other major languages of the Philippines such as the Visayan languages, Presidente is more common when Filipinos are not actually code-switching with the English word. Depending on the definition chosen for these terms, a number of persons could alternatively be considered the inaugural holder of the office. Andrés Bonifacio could be considered the first President of a united Philippines since he was the third Supreme President (Spanish: Presidente Supremo; Filipino: Kataas-taasang Pangulo) of the Katipunan, a secret revolutionary society. Its Supreme Council, led by the Supreme President, coordinated provincial and district councils. When the Katipunan started an open revolt against the Spanish colonial government in August 1896, Bonifacio transformed the society into a revolutionary government with him as its head. While the term Katipunan remained, Bonifacio's government was also known as the Tagalog Republic (Spanish: República Tagala; Filipino: Republikang Tagalog). Although the word Tagalog refers to the Tagalog people, a specific ethno-linguistic group, Bonifacio used it to denote all non-Spanish peoples of the Philippines in place of Filipinos, which had colonial origins. Bonifacio's revolutionary government never controlled much territory for any significant period and was unrecognized and even unknown to the non-Tagalog ethnnolinguistic groups. Some historians contend that including Bonifacio as a past president would imply that Macario Sacay and Miguel Malvar should also be included. In March 1897, during the Philippine Revolution against Spain Emilio Aguinaldo was elected president of the revolutionary government at the Tejeros Convention. The new government was meant to replace the Katipunan, though the latter was not formally abolished until 1899. Aguinaldo was again elected President at Biak-na-Bato in November, leading the Republic of Biak-na-Bato. Aguinaldo therefore signed the Pact of Biak-na-Bato and went into exile in Hong Kong at the end of 1897. In April 1898, the Spanish–American War broke out, and the Asiatic Squadron of the United States Navy sailed for the Philippines. At the Battle of Manila Bay on May 1, 1898 the American Navy decisively defeated the Spanish Navy effectively ending Spanish rule in the Philippines. Aquinaldo subsequently returned to the Philippines aboard a U.S. Navy vessel and renewed the revolution. He formed a dictatorial government on May 24, 1898 and issued the Philippine Declaration of Independence on June 12, 1898. On June 23, 1898, Aguinaldo transformed his dictatorial government into a revolutionary government. On January 23, 1899, he was then elected President of the First Philippine Republic, a government constituted by the Malolos Congress under the Malolos Constitution. Consequently, this government is also called the Malolos Republic. The First Philippine Republic was short-lived and never internationally recognized. The Philippines was transferred from Spanish to American control by the Treaty of Paris of 1898, signed in December of that year. The Philippine–American War broke out between the United States and Aguinaldo's government. His government effectively ceased to exist on April 1, 1901, after he pledged allegiance to the United States following his capture by U.S. forces in March. The current government of the Republic of the Philippines, considers Emilio Aguinaldo to be the first President of the Philippines. Miguel Malvar continued Aguinaldo's leadership of the Philippine Republic after the latter's capture until his own capture in 1902, while Macario Sakay founded a Tagalog Republic in 1902 as a continuing state of Bonifacio's Katipunan. They are both considered by some scholars as "unofficial presidents", and along with Bonifacio, are not recognized as Presidents by the government. 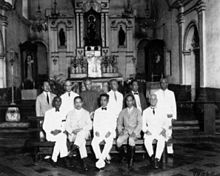 Between 1901 and 1935, executive power in the Philippines was exercised by a succession of four American military Governors-General and eleven civil Governors-General. In October 1935, Manuel L. Quezon was elected the first President of the Commonwealth of the Philippines, which had been established, still under United States sovereignty, under a constitution ratified on 14 May of that year. During its first five years, the President could serve for an unrenewable six-year term. It was later amended in 1940 to limit a President to serving no more than two four-year terms. 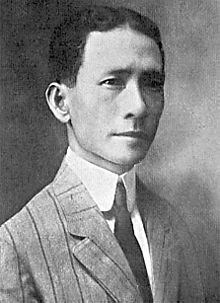 When President Quezon exiled himself to the United States after the Philippines fell to the Empire of Japan in World War II, he appointed Chief Justice José Abad Santos as Acting President and as Acting Commander-in Chief of the Armed Forces. Abad Santos was subsequently executed by the Imperial Japanese Army on May 2, 1942. On October 14, 1943, José P. Laurel became President under a constitution imposed by the Japanese occupation. Laurel, an Associate Justice of the Supreme Court of the Philippines, had been instructed to remain in the City of Manila by President Quezon, who withdrew to Corregidor and then to the United States to establish a government in exile in the United States. The General Headquarters and Military Camp Base of the Philippine Commonwealth Army was a military station are moved in the province. After the combined American and Filipino forces liberated the islands in 1945, Laurel officially dissolved the republic on August 17, 1945. The 1935 Constitution was restored after the Japanese surrender ended World War II, with Vice President Sergio Osmeña becoming President due to Quezon's death on August 1, 1944. It remained in effect after the United States recognized the sovereignty of the Republic of the Philippines as a separate self-governing nation on July 4, 1946. A new Constitution ratified on January 17, 1973 under the rule of Ferdinand E. Marcos introduced a parliamentary-style government. Marcos instituted himself as Prime Minister while serving as President in 1978. He later appointed César Virata as Prime Minister in 1981. This Constitution was in effect until the People Power Revolution of 1986 toppled Marcos's 21-year authoritarian regime and replaced him with Corazon C. Aquino. Ruling by decree during the early part of her tenure and as a president installed by revolutionary means, President Corazon Aquino issued Proclamation No. 3 on March 25, 1986 which abrogated many of the provisions of the then 1973 Constitution, including the provisions associated with the Marcos regime which gave the President legislative powers, as well as the unicameral legislature called the Batasang Pambansa (literally National Legislature in Filipino). Often called the "Freedom Constitution," the proclamation retained only parts of the 1973 Constitution that were essential for a return to democratic rule, such as the bill of rights. This constitution was superseded on February 2, 1987 by the present constitution. Both Bonifacio and Aguinaldo might be considered to have been an inaugural president of an insurgent government. Quezon was the inaugural president of a predecessor state to the current one, while Aquino, mère, was the inaugural president of the currently-constituted government. The government considers Aguinaldo to have been the first President of the Philippines, followed by Quezon and his successors. Despite the differences in constitutions and government, the line of presidents is considered to be continuous. For instance, the current president, Rodrigo R. Duterte, is considered to be the 16th president. While the government may consider Aguinaldo as the first president, the First Republic fell under the United States' jurisdiction due to the 1898 Treaty of Paris which ended the Spanish–American War; the United States thus does not consider his tenure to have been legitimate. 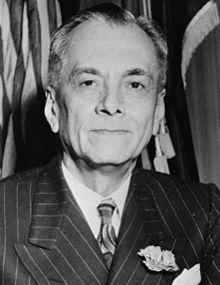 Manuel L. Quezon is considered to be the first president by the United States. He is also the first to win a popular election and a nationwide election. As with many other Axis-occupied countries in the Second World War, the Philippines had at one point two presidents heading two governments. One was Quezon and the Commonwealth government-in-exile in Washington, D.C., and the other was Manila-based Laurel heading the Japanese-sponsored Second Republic. Notably, Laurel was himself instructed to remain in Manila by President Quezon. Laurel was not formally recognized as a President until the rule of Diosdado Macapagal. His inclusion in the official list coincided with the transfer of the official date of Independence Day from July 4 (the anniversary of the Philippines' independence from the United States) to June 12 (the anniversary of the 1898 Declaration of Independence). The inclusion of Laurel thus causes some problems in determining the order of presidents. It is inaccurate to call Laurel the successor of Osmeña or vice versa, since Laurel's Second Republic was formally repudiated after World War II, its actions not considered legal or binding. Quezon, Osmeña, and Roxas were seen as being in a contiguous line according to the 1935 Constitution, while Laurel was the only president of the Second Republic, which had a separate charter. Thus, Laurel had neither predecessor nor successor, while Osmeña succeeded Quezon after the latter's death, and was in turn succeeded by Roxas as President of the Third Republic. The President of the Philippines, being the chief executive, serves as both the head of state and head of government of the Philippines. The constitution vests the executive power with the president who consequently heads the government's executive branch, including the Cabinet and all executive departments. The president has power to grant reprieves, commutations and pardons, and remit fines and forfeitures after conviction by final judgment, except in cases of impeachment. The president can grant amnesty with the concurrence of the majority of all the Members of the Congress. The president has authority to contract or guarantee foreign loans on behalf of the Republic but only with the prior concurrence of the Monetary Board and subject to such limitations as may be provided by law. The president also exercises general supervision over local government units. The President also serves as the Commander-in-Chief of the Armed Forces of the Philippines. This includes the power to suspend the writ of habeas corpus and to declare Martial law. With the consent of the Commission on Appointments, the president also appoints the heads of the executive departments, board of members and its leaders from any national government-related institutions, ambassadors, other public ministers and consuls, high-ranking officers of the armed forces, and other officials. The members of the Supreme Court and lower courts are also appointed by the president, but only from the list of nominees prepared by the Judicial and Bar Council. Such appointments do not need the approval of the Commission on Appointments. Some government agencies report to no specific department but are instead under the Office of the President. These include important agencies such as the National Security Council, Office of The Presidential Adviser on the Peace Process, Commission on Human Rights, Commission on Higher Education, Climate Change Commission, Commission on Population, Housing and Land Use Regulatory Board, Metropolitan Manila Development Authority, Movie and Television Review and Classification Board, Authority of the Freeport Area of Bataan, Subic Bay Metropolitan Authority, and many more. The Presidential Security Group, which is composed mostly of members from the Armed Forces of the Philippines and the Philippine National Police, is directly under the Office of the President. Article 7, Section 2 of the Constitution reads: "No person may be elected President unless he is a natural-born citizen of the Philippines, a registered voter, able to read and write, at least forty years of age on the day of the election, and a resident of the Philippines for at least ten years immediately preceding such election." The Constitution also provides term limits where the President is ineligible for reelection and a person who has succeeded as President and has served as such for more than four years will be ineligible to be elected for a second term. However, with the case of Joseph Estrada who was elected president in 1998, deposed in 2001, and again ran for the presidency in 2010, the Constitution's wording where "[the] President shall not be eligible for any re-election" remains unclear as his case was never brought to the Supreme Court. It remains unclear whether the term limit of no re-election applies only to the incumbent President or for any person who has been elected as President. Home provinces (blue and purple) of the Presidents. The President is elected by direct vote every six years, usually on the second Monday of May. The returns of every election for President and Vice President, duly certified by the board of canvassers of each province or city, shall be transmitted to Congress, directed to the President of the Senate. Upon receipt of the certificates of canvass, the President of the Senate shall open all the certificates in the presence of a joint public session of Congress not later than 30 days after election day. Congress then canvasses the votes upon determining that the polls are authentic and were done in the manner provided by law. The person with the highest number of votes is declared the winner, but in case two or more have the highest number of votes, the President is elected by a majority of all members of both Houses, voting separately on each. Rodrigo Duterte during his inauguration. Traditionally, the Vice President takes the Oath first, a little before noon. This is for two reasons: first, according to protocol, no one follows the President (who is last due to his supremacy), and second, to establish a constitutionally valid successor before the President-elect accedes. During the Quezon inauguration, however, the Vice President and the Legislature were sworn in after the President, to symbolise a new start. As soon as the President takes the Oath of Office, a 21-gun salute is fired to salute the new head of state, and the Presidential Anthem Mabuhay is played. The President delivers his inaugural address, and then proceeds to Malacañang Palace to climb the Grand Staircase, a ritual which symbolises the formal possession of the Palace. The President then inducts the newly formed cabinet into office in one of the state rooms. Custom has enshrined three places as the traditional venue for the inauguration ceremony: Barasoain Church in Malolos City, Bulacan; in front of the old Legislative Building (now part of the National Museum) in Manila; or at Quirino Grandstand, where most have been held. 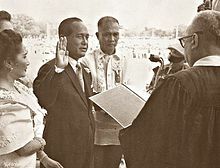 In 2004, Gloria Macapagal Arroyo delivered her pre-inaugural address at Quirino Grandstand, took the Oath of Office in Cebu City before Chief Justice Hilario Davide Jr., and the next day held the first cabinet meeting in Butuan City. She broke with precedent, reasoning that she wanted to celebrate her inauguration in each of the three main island groups of the Philippines: Luzon, Visayas, and Mindanao. Her first inauguration also broke precedent as she was sworn in at the EDSA Shrine on January 20, 2001, during the EDSA Revolution of 2001 that removed Joseph Estrada from office. In the past, elections were held in November and the President's inauguration was held on December 30 (Rizal Day). This ensured that when the inauguration was usually held at Quirino Grandstand, the new President could see the Rizal Monument on the anniversary of his death. Ferdinand Marcos transferred the dates of both the elections and the inauguration to May and June, respectively, and it remains so to this day. The dress code at the modern inaugural ceremony is traditional, formal Filipino clothing, which is otherwise loosely termed Filipiniana. Ladies must wear terno, baro't saya (the formal wear of other indigenous groups is permissible), while men don the Barong Tagalog. Non-Filipinos at the ceremony may wear their respective versions of formal dress, but foreign diplomats have often been seen donning Filipiniana as a mark of cultural respect. Impeachment in the Philippines follows procedures similar to the United States. The House of Representatives, one of the houses of the bicameral Congress, has the exclusive power to initiate all cases of impeachment against the President, Vice President, members of the Supreme Court, members of the Constitutional Commissions and the Ombudsman. When a third of its membership has endorsed the impeachment articles, it is then transmitted to the Senate of the Philippines which tries and decide, as impeachment tribunal, the impeachment case. A main difference from US proceedings however is that only a third of House members are required to approve the motion to impeach the President (as opposed to the majority required in the United States). In the Senate, selected members of the House of Representatives act as the prosecutors and the Senators act as judges with the Senate President and Chief Justice of the Supreme Court jointly presiding over the proceedings. Like the United States, to convict the official in question requires that a minimum of two-thirds (i.e., 16 of 24 members) of the senate vote in favour of conviction. If an impeachment attempt is unsuccessful or the official is acquitted, no new cases can be filed against that impeachable official for at least one full year. The Constitution enumerates the culpable violation of the Constitution, treason, bribery, graft and corruption, other high crimes, and betrayal of public trust as grounds for the impeachment of the President. The same also applies for the Vice President, the Members of the Supreme Court, the Members of the Constitutional Commissions, and the Ombudsman. Joseph Ejercito Estrada was the first President to undergo impeachment when the House of Representatives voted to raise the impeachment proceedings to the Senate in 2000. However, the trial ended prematurely where anti-Estrada senators walked out of the impeachment sessions when Estrada's allies in the Senate voted narrowly to block the opening of an envelope which allegedly contained critical evidence on Estrada's wealth. Estrada was later ousted from office when the 2001 EDSA Revolution forced him out of the presidential palace and when the Supreme Court confirmed that his leaving the palace was his de facto resignation from office. Several impeachment complaints were filed against Gloria Macapagal-Arroyo but none reached the required endorsement of a third of the House of Representatives. The official title of the Philippine head of state and government is "President of the Philippines." The title in Filipino is Pangulo (cognate of Malay penghulu "leader", "chieftain"). The honorific for the President is "Your Excellency" or "His/Her Excellency", adopted from the title of the Governor-General of the Philippines during Spanish and American occupation. The term "President of the Republic of the Philippines" used under Japanese occupation of the Philippines distinguished the government of then-President José P. Laurel from the Commonwealth government-in-exile under President Manuel L. Quezon. 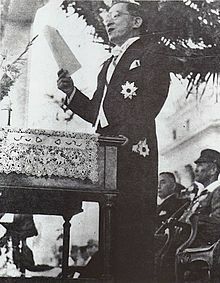 The restoration of the Commonwealth in 1945 and the subsequent independence of the Philippines restored the title of "President of the Philippines" enacted in the 1935 constitution. The 1973 constitution, though generally referring to the president as "President of the Philippines" did, in Article XVII, Section 12, once use the term, "President of the Republic." In the text of Proclamation No. 1081 that announced martial law in September 1972, President Ferdinand E. Marcos consistently referred to himself as "President of the Philippines." Ferdinand Marcos was the only President to serve three terms (1965–1969, 1969–1981, 1981–1986). The 1935 Constitution originally set the president's term at six years, without re-election. In 1940, however, the 1935 Constitution was amended and the term of the President (and Vice President) was shortened to four years, with a two-term limit. Under the provisions of the amended 1935 document, only Presidents Manuel L. Quezon (1941) and Ferdinand E. Marcos (1969) were re-elected. Presidents Sergio Osmeña (1946), Elpidio Quirino (1953), Carlos P. Garcia (1961) and Diosdado Macapagal (1965) all failed in seeking a new term. However, in 1973, a new Constitution was promulgated and allowed then-incumbent President Marcos to seek a new term. In 1981, Marcos was again elected as President against Alejo Santos – making him the only President to be elected to a third term. The 1987 Constitution restored the 1935 Constitution's original ban on presidential reelection. Under Article 7, Section 4 of the current constitution, the term of the President shall begin at noon on the thirtieth day of June next following the day of the election and shall end at noon of the same date, six years thereafter. The incumbent President is not eligible for re-election, even if non-consecutive. Moreover, no president who serves more than four years of a presidential term is allowed to run or serve again. Under Article 7, Section 7 of the Constitution of the Philippines, In case the president-elect fails to qualify, the Vice President-elect shall act as President until the President-elect shall have qualified. Where no President and Vice President shall have been chosen or shall have qualified, or where both shall have died or become permanently disabled, the President of the Senate or, in case of his inability, the Speaker of the House of Representatives, shall act as President until a President or a Vice President shall have been chosen and qualified. Sergio Osmeña was the first Vice President to succeed to the presidency upon the death of a chief executive who was Manuel L. Quezon in 1944. Article 7, Sections 8 and 11 of the Constitution of the Philippines provide rules of succession to the presidency. In case of death, permanent disability, removal from office, or resignation of the President, the Vice President will become the President to serve the unexpired term. In case of death, permanent disability, removal from office, or resignation of both the President and Vice President; the President of the Senate or, in case of his inability, the Speaker of the House of Representatives, shall then act as President until the President or Vice President shall have been elected and qualified. The Congress shall, by law, provide who shall serve as President in case of death, permanent disability, or resignation of the Acting President. He shall serve until the President or the Vice President shall have been elected and qualified, and be subject to the same restrictions of powers and disqualifications as the Acting President. The line of presidential succession as specified by Article VII, Section 8 of the Constitution of the Philippines are the Vice President, Senate President and the Speaker of the House of Representatives. Contrary to popular belief, the Chief Justice of the Supreme Court of the Philippines is not in the line of succession. If the offices of both the President and the Vice President become vacant at the same time, Congress shall enact a law calling for a special election. However, if the presidential election is 18 months away, no special election shall be called. Malacañang Palace, the official residence of the President of the Philippines. Before the Malacañang Palace was designated as the official residence of the President, various establishments served as residence of the chief executive. The Spanish Governor-General, the highest-ranking official in the Philippines during the Spanish Era, resided in the Palacio del Gobernador inside the walled city of Intramuros. However, after an earthquake in 1863, the Palacio del Gobernador was destroyed, and the residence and office of the Governor-General transferred to Malacañang Palace. During the Philippine Revolution, President Aguinaldo resided in his own home in Kawit, Cavite. After his defeat in the Philippine–American War, Aguinaldo transferred the Capital of the Philippines to different areas while he struggled in the pursuit of American Forces. When the Americans occupied the Philippines, they also used the Palace as an official residence. During the Japanese Occupation of the Philippines, the governmental offices and the presidential residence transferred to Baguio, and the Mansion House was used as the official residence. Meanwhile, President Quezon of the Philippine Commonwealth resided in the Omni Shoreham Hotel in Washington D.C. After the restoration of independence, plans were made for the construction of a new capital city. However, the plans did not push through and Manila remained as the capital city, and Malacañang Palace as the President's official residence. The Filipino name is derived from the Tagalog phrase "may lakán diyán", ("there is a nobleman there"), and this was eventually shortened to Malakanyáng. Malacañang Palace serves as the official residence of the President of the Philippines, a privilege entitled to him/her under Article VII, Section 6 of the Constitution. The Palace is located along the north bank of the Pasig River, along J.P. Laurel Street in the district of San Miguel, Manila. Malacañang Palace is depicted on the reverse side of the 20-peso bill in the Pilipino, Ang Bagong Lipunan, New Design, and the present New Generation series. The actual residence of incumbent President Rodrigo Duterte is Bahay Pangarap (English: House of Dreams), a smaller structure located across the Pasig River from Malacañang Palace in Malacañang Park, which is itself part of the Presidential Security Group Complex. Former President Aquino was the first President to live in Bahay Pangarap his official residence. Malacañang Park was originally built by former President Manuel L. Quezon as a rest house and venue for informal activities and social functions for the First Family. The house was built and designed by architect Juan Arellano in the 1930s, and underwent a number of renovations. In 2008, the house was demolished and rebuilt in contemporary style by architect Conrad Onglao, and a new swimming pool was built, replacing the Commonwealth Era one. The house originally had one bedroom, however, it was renovated for Aquino to have four bedrooms, a guest room, a room for his household staff, and a room for his close-in security. Malacañang Park was refurbished through the efforts of First Lady Eva Macapagal, the second wife of President Diosdado Macapagal, in the early 1960s. Mrs. Macapagal renamed the rest house as Bahay Pangarap. Under Fidel V. Ramos, Bahay Pangarap was transformed into a clubhouse for the Malacañang Golf Club. The house was subsequently used by President Gloria Macapagal-Arroyo to welcome special guests. Aquino made it clear before he assumed office that he refused to live in the main Palace, or in the nearby Arlegui Mansion (where he once lived during his mother's rule and where Ramos later stayed), stating that both were too big. He lived in the Aquino family residence along Times Street, Quezon City in the first few days of his rule, although he transferred to Bahay Pangarap because it was deemed a security concern for his neighbours if he stayed in their small, 1970s home. An Aérospatiale SA-330 Puma carrying President Corazon C. Aquino at Subic Bay Naval Base. The 250th (Presidential) Airlift Wing of the Philippine Air Force has the mandate of providing safe and efficient air transport for the President of the Philippines and the First Family. On occasion, the wing has also been tasked to provide transportation for other members of government, visiting heads of state, and other state guests. The fleet includes: 1 Fokker F28, which is primarily used for the President's domestic trips and it is also called "Kalayaan One" when the President is on board, 4 Bell 412 helicopters, 3 Sikorsky S-76 helicopters, 1 Sikorsky S-70-5 Black Hawk, a number of Bell UH-1N Twin Hueys, as well as Fokker F-27 Friendships. For trips outside of the Philippines, the Air Force employs a Bombardier Global Express or charters appropriate aircraft from the country's flag carrier, Philippine Airlines. In 1962, the Air Force chartered aircraft from Pan American World Airways as the international services of Philippine Airlines were suspended. Pan Am later went defunct in 1991. For short-haul flights, PAL used the Boeing 737 until they were replaced by Airbus A320 and Airbus A321 aircraft. For medium to long-haul flights, the airline's Boeing 747-400's were used until their retirement in September 2014. The Airbus A330-300, Airbus A350-900 and Boeing 777-300ER have since fulfilled these roles. Any PAL aircraft with the flight number PR/PAL 001 and callsign PHILIPPINE 001 is a special plane operated by Philippine Airlines to transport the President of the Philippines. The President sometimes charter private jets for domestic trips within the Philippines due to some airports in the Philippines having small runways. A Presidential Helicopter Bell 412 crashed on April 7, 2009, in the mountainous Ifugao Province north of Manila. On board were eight people, including two Cabinet undersecretaries and several servicemen. The flight was en route to Ifugao from Baguio City as an advance party of President Macapagal-Arroyo, when the control tower at the now-defunct Loakan Airport lost communication with the craft several minutes after takeoff. The Arroyo administration planned to buy another aircraft worth of about 1.2 billion pesos before her term ended in June 2010, but cancelled the purchase due to other issues. BRP Ang Pangulo (BRP stands for Barkó ng Repúblika ng Pilipinas, "Ship of the Republic of the Philippines"; "Ang Pangulo" is Filipino for "The President") was commissioned by the Philippine Navy on March 7, 1959. It was built in and by Japan during the administration of President García as part of Japanese reparations to the Philippines for World War II. It is primarily used in entertaining guests of the incumbent President. The President of the Philippines uses two black and heavily armored Mercedes-Benz W221 S600 Guard, whereas one is a decoy vehicle. In convoys, the President is escorted by the Presidential Security Group using primarily Nissan Patrol SUVs with the combination of the following vehicles: Audi A6, BMW 7 Series, Chevrolet Suburban, Hyundai Equus, Hyundai Starex, Toyota Camry, Toyota Fortuner, Toyota Land Cruiser, Philippine National Police 400cc motorcycles, Philippine National Police Toyota Altis (Police car variant), other government-owned vehicles, and ambulances at the tail of the convoy; the number depends on the destination. The presidential cars are designated and registered a plate number of 1 or the word PANGULO (President). The limousine bears the Flag of the Philippines and, occasionally, the Presidential Standard. For regional trips, the President boards a Toyota Coaster or Mitsubishi Fuso Rosa or other vehicles owned by government-owned and controlled corporations or government agencies. In this case, the PSG escorts the President using local police cars with an ambulance at the tail of the convoy. Former President Benigno Aquino III, preferred to use his personal vehicle, a Toyota Land Cruiser 200 or his relative's Lexus LX 570 over the black Presidential limousines after their electronic mechanisms were damaged by floodwater. The Palace has announced its interest to acquire a new Presidential limousine. The current President, Rodrigo Duterte, prefers to utilize a white, bullet-proof armored Toyota Landcruiser as his official presidential vehicle instead of the "luxurious" Mercedes-Benz W221 S600 Guard, in his commitment to being the "People's President". The Office of the President has also owned various cars over the decades, including a 1937 Chrysler Airflow that served as the country's very first Presidential limousine for Manuel L. Quezon. The Presidential Security Group (abbreviated PSG), is the lead agency tasked with providing security for the President, Vice President, and their immediate families. They also provide protective service for visiting heads of state and diplomats. Unlike similar groups around the world who protect other political figures, the PSG is not required to handle presidential candidates. However, former Presidents and their immediate families are entitled to a small security detail from the PSG. Currently, the PSG uses Nissan Patrol SUVs as its primary security vehicles. Presidents Emilio Aguinaldo and Manuel L. Quezón during the 1935 campaign. After leaving office, a number of presidents held various public positions and made an effort to remain in the limelight. Among other honors, former Presidents and their immediate families are entitled to three soldiers as security detail. José P. Laurel, who was the only President of the Second Philippine Republic, was elected to the Senate in 1951 and would serve in the upper house until 1957, making him the country's first head of state to seek lower office following his presidency. During his tenure, the Nacionalista Party urged him to run for president in 1953. He declined, working instead for the successful election of Ramon Magsaysay, who subsequently appointed Laurel to head a diplomatic mission that was tasked with negotiating trade and other issues with United States officials, resulting in the Laurel-Langley Agreement. Laurel was also the chairman of the Economic Mission to the United States (1954) and the founder of Lyceum of the Philippines University. Sergio Osmeña became a member of the Council of State under Roxas, Quirino, Magsaysay, and García. He was also a member of the National Security Council in the García administration. Elpidio Quirino also became a Councillor of State under President Magsaysay. Carlos P. Garcia was a delegate, later elected, president of the Constitutional Convention on July 11, 1971. Diosdado Macapagal was also a delegate and then succeeded Carlos P. García as president of the 1971 Constitutional Convention. He also lectured in universities and was later a Councillor of State under Presidents Aquino mère and Ramos. Corazon Aquino was a member of the National Security Council under Ramos, Estrada and Arroyo. She was also a member of the Council of State under President Arroyo. Fidel Ramos founded the Ramos Peace and Development Foundation. He was a senior advisor and member of the National Security Council under President Estrada. Ramos was a member of the Council of State and an Ambassador-at-Large under President Arroyo. He was later appointed as special envoy to china under President Duterte to open bilateral negotiations with China over the disputes in the South China Sea but later resigned on November 1 following President Duterte's state visit to Beijing on October 16, 2016. Joseph Estrada returned to film in November 2009, starring in Ang Tanging Pamilya: A Marry Go Round as part of a promotional attempt to run for a second term as president in 2010 amid much controversy on the legality of his intent (he was allowed to run anyway by COMELEC since the Supreme Court never weighed in on the matter) with many questioning why such a constitutional violation was ever allowed. His release from prison in 2007 by his successor, Gloria Macapagal Arroyo, questionably restored his political privileges and allowed him to run again. Estrada eventually became a member of the National Security Council under Arroyo. Following his loss to Noynoy Aquino in 2010, he geared up for a run against Alfredo Lim for control of the City of Manila in 2013, which he won and as a result, Estrada is now the incumbent Mayor of the city of Manila, thus making him the third head of state to run for lower office following his presidency. Gloria Macapagal Arroyo ran for and won a seat in the House of Representatives of the Philippines as the Representative for the 2nd District of Pampanga in the 2010 elections, making her the second head of state after Laurel to seek lower office following her presidency. Arroyo would later serve in major positions in the House of Representatives such as Deputy Speaker from 2016 to 2017 and was elected as Speaker on July 23, 2018, making her the first woman to hold that position. Incumbent President Rodrigo Roa Duterte (center) with (from left) former Presidents Joseph Ejercito Estrada, Gloria Macapagal-Arroyo, Fidel V. Ramos, and Benigno S. Aquino III, before the start of a National Security Council meeting at the Malacañang Palace on July 27, 2016. ^ The four vice presidents who succeeded to the presidency upon their predecessor's death or resignation and finished-out that unexpired term are: Sergio Osmeña (1944); Elpidio Quirino (1948); Carlos P. Garcia (1957); Gloria Macapagal Arroyo (2001). ^ "Emilio Aguinaldo". Official Gazette of the Philippine Government. March 22, 2011. ^ Guevara, Sulpico, ed. (2005). The laws of the first Philippine Republic (the laws of Malolos) 1898–1899. Ann Arbor, Michigan: University of Michigan Library (published 1972). Retrieved January 10, 2011. ^ Compensation and Position Classification Act of 1989 (August 21, 1989), Chan Robles Virtual Law Library. ^ a b c d e f g "1987 Constitution of the Republic of the Philippines". Chan Robles Virtual Law Library. Retrieved January 7, 2008. ^ "EXECUTIVE ORDER NO. 611, AUTHORIZING COMPENSATION ADJUSTMENTS TO GOVERNMENT PERSONNEL]". Official Gazette. Government of the Philippines. July 1, 2007. ^ Borromeo & Borromeo-Buehler 1998, p. 135 (in "Document G", Account of Mr. Bricco Brigado Pantos). ^ Halili & Halili 2004, pp. 138–139. ^ Severino, Howie (November 27, 2007). "Bonifacio for (first) president". GMA News. .
^ * Guerrero, Milagros; Schumacher, S.J., John (1998). Reform and Revolution. Kasaysayan: The History of the Filipino People. 5. Asia Publishing Company Limited. ISBN 962-258-228-1. .
^ * Guerrero, Milagros; Encarnación, Emmanuel; Villegas, Ramón (1996). "Andrés Bonifacio and the 1896 Revolution". Sulyap Kultura. National Commission for Culture and the Arts. 1 (2): 3–12. .
^ Ambeth Ocampo (May 11, 2010). "Bonifacio, First President of the Philippines?". Philippine Daily Inquirer. ^ Ambeth Ocampo (May 11, 2007). "Looking Back: Election fraud at the Tejeros Convention". Archived from the original on June 30, 2010. .
^ Regalado, Felix B., and Quintin B. Franco (1973). History of Panay. Jaro, Iloilo City: Central Philippine University. ^ "The U.S. Occupation of the Philippines". University of Colorado American Studies. Retrieved February 13, 2015. ^ a b c Tucker, Spencer C. (2009). The encyclopedia of the Spanish-American and Philippine-American wars: a political, social, and military history. ABC-CLIO. p. 8. ISBN 978-1-85109-951-1. ^ "The Manila Times – Trusted Since 1898". Archived from the original on December 11, 2008. Retrieved February 13, 2015. ^ Flores, Paul (August 12, 1995). "Macario Sakay: Tulisán or Patriot?". Philippine History Group of Los Ángeles. Archived from the original on June 9, 2007. Retrieved April 8, 2007. ^ "Official Gazette of the Republic of the Philippines". Retrieved February 13, 2015. ^ Emilio Aguinaldo y Famy, U.S. Library of Congress. ^ 1987 Constitution of the Philippines, art. 7, sec. 20. ^ 1987 Constitution of the Philippines, art. 10, sec. 4. ^ a b 1987 Constitution of the Philippines, art. 7, sec. 18. ^ 1987 Constitution of the Philippines, art. 7, sec. 16. ^ 1987 Constitution of the Philippines, art. 8, sec. 9. ^ "Agencies/Offices under the Office of the President". Presidential Communications Operations Office. Government of the Philippines. Retrieved January 6, 2016. ^ "Konstitusyon ng Pilipinas, art. 7, sek. 5". Official Gazette of the Republic of the Philippines. ^ Chan-Robles Virtual Law Library. "The 1987 Constitution of the Republic of the Philippines – Article XI". Retrieved July 25, 2008. ^ Constitution of the Philippines, art. 11, sec. 2. ^ PROCLAMATION No. 1081 (September 21, 1972), PROCLAIMING A STATE OF MARTIAL LAW IN THE PHILIPPINES, Lawphil.net. ^ "A century of alternative Malacañangs". The Philippine Star. ^ a b c d e f g h i j "Bahay Pangarap: Aquino's future home?". ^ a b "How was PNoy's first night at Bahay Pangarap?". ^ a b "Noynoy's new home is Bahay Pangarap". ^ a b c "Bahay Pangarap for P-Noy ready". ^ a b c d e f g "Briefer on Bahay Pangarap and Malacañang Park". ^ The Presidential Yachts, Official Gazette, Office of the President. ^ "NEW SPEAKER? Gloria takes seat at House rostrum, Alvarez welcomes Duterte". GMA News Online. Retrieved July 23, 2018. Borromeo, Soledad Masangkay; Borromeo-Buehler, Soledad (1998). The Cry of Balintawak: A contrived Controversy: A Textual Analysis with Appended Documents. Ateneo de Manila University Press. ISBN 978-971-550-278-8. Halili, Christine N; Halili, Maria Christine (2004). Philippine History. Rex Bookstore, Inc. ISBN 978-971-23-3934-9. Wikimedia Commons has media related to Presidents of the Philippines.